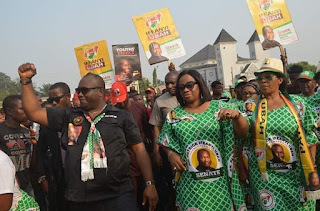 The information reaching Akelicious states that the Leader of APGA has directed, Chief Jude Emecheta, the Managing Director of Anambra State Signage and Advertisement Agency, to destroy all the billboards and campaign materials of Dr Patrick Ifeanyi Ubah and YPP. A source who monitored the directive told Akelicious that the directive was given today and that any moment from now, all billboards and campaign materials belonging to Dr Patrick Ifeanyi Ubah, the senatorial candidate of YPP in Anambra south senatorial candidates will be vandalised. Why APGA govt is targeting Dr Patrick Ifeanyi Ubah for victimization is still unknown. It is on record that Dr Patrick Ifeanyi Ubah contributed immensely to the 21/21 victory of gov Obiano. It is also also on record that Ifeanyi Ubah was taken away by the DSS on the even of the November 18 governorship election and whisked away to Abuja. He went through all these humiliations because he was working to ensuring that gov Obiano comes out victorious in that election. What crime did he commit that all hell has been directed against him by those he worked tirelessly to deliver in their own election? The directive is an indication that YPP has taken over Anambra south senatorial zone and will emerge victorious on February 16. The new APGA owners are paying all those that helped them to win the governorship election with evil, but God will surely vindicate his people. They can destroy the billboards and campaign materials of Dr Patrick Ifeanyi Ubah, but the people will respond with their voters card on Saturday.